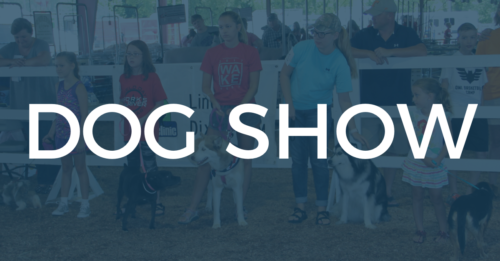 The Dog Show at the Smith County Fair will take place at the Smith County Ag Center at 10:00 a.m. on Saturday, July 7, 2018. There will be an entry fee of $3 for each class. 1. All dogs on the fairgrounds must be on a leash or in a carrier. 2. Dog handlers may be any age, except in Junior Handling. 3. Entries will be taken on day of judging between 8:30 a.m. and 9:30 a.m.
Division 1 – JUNIOR HANDLING – Open to participants who are 18 years and under. This class will be judged on the participant’s handling/exhibiting ability and grooming of the dog. Pointers, Retrievers, Setters, Spaniels, etc. Collies, Heelers, Cattle Dogs, Dobermans, Goat Dogs, etc. Coonhounds, Treeing Walkers, Beagles, Foxhounds, etc. Poodles, Bulldogs, Shi-Tzu, Yorkshire Terriers, Havanese, Bichons, Westies, Scotties, etc. Designer Breeds (Shorkies, Poo-Chons, Teddy Bears, etc) & Mixed Breeds. The 1st place winner from divisions 2-5 will compete for “Best In Show” after each division has been judged. For more information, contact Lindsey Dixon at 615-735-3330. The Dog Show is sponsored by the Smith County Animal Clinic.